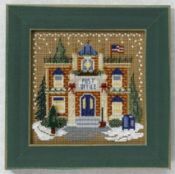 The Barber Shoppe is another in the Winter Seriers of the Christmas Village from the Mill Hill Buttons and Beads. This 5.25w x 5.25h design is stitched on Perforated Paper included in the kit. Also included is the DMC floss, Mill Hill Beads and a red star button from Mill Hill.You must add this to your village collection. 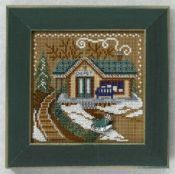 Book Seller another Mill Hill Buttons and Beads kit in the Winter Series of the Christmas Village. This kit is approximately 5 1/2 inches by 5 1/2 inches with the Perforated Paper, beads, DMC floss and a stack of books button to complete this great shop. 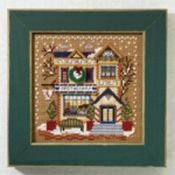 Christmas Village-Apothecary from Mill Hill Button & Beads kit is stitched on 14ct Brown Perforated Paper with a finished size of 5" x 5". Perforated Paper, threads, beads and a Wreath button are included in the kit. 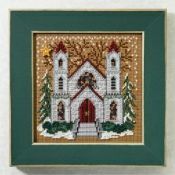 Christmas Village-Country Church from Mill Hill Button & Beads kit is stitched on 14ct Brown Perforated Paper with a finished size of 5" x 5". Perforated Paper, threads, beads and a Star button are included in the kit. 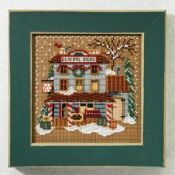 The General Store by Mill Hill from the Christmas Village series is stitched on 14count perforated paper. 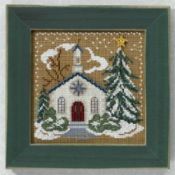 This kit includes floss, beads and a peppermint button to enhance your finished piece. The design size is 5" x 5". 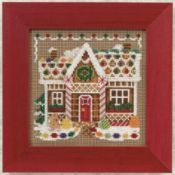 Christmas Village-Gingerbread House from Mill Hill Button & Beads kit is stitched on 14ct Brown Perforated Paper with a finished size of 5" x 5". Perforated Paper, threads, beads and a Gingerbread Man button are included in the kit. 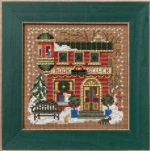 Christmas Village-Post Office from Mill Hill Button & Beads kit is stitched on 14ct Brown Perforated Paper with a finished size of 5" x 5". Perforated Paper, threads, beads and a Christmas tree button are included in the kit. St. Nicholas Cathedral one of the Buttons and Beads Kits in the Christmas Village collection is complete with 14count perforated paper, DMC floss, beads and a Mill Hill button to complete this kit. The design size is 5" x 5". 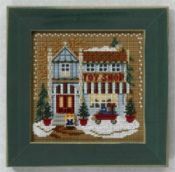 Christmas Village-Toy Shop from Mill Hill Button & Beads kit is stitched on 14ct Brown Perforated Paper with a finished size of 5" x 5". Perforated Paper, threads, beads and a little girl button are included in the kit. The Train Depot from Mill Hill Winter Series Christmas Village stitched on 14count perforated paper. The kit contains the perforated paper, floss, beads and a sleigh button. 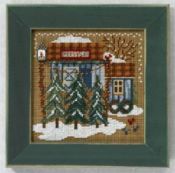 Christmas Village-Tree Farm from Mill Hill Button & Beads kit is stitched on 14ct Brown Perforated Paper with a finished size of 5" x 5". Perforated Paper, threads, beads and a Bird House button are included in the kit. 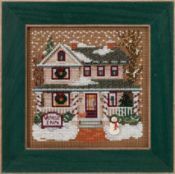 Christmas Village-Village Inn from Mill Hill Button & Beads kit is stitched on 14ct Brown Perforated Paper with a finished size of 5" x 5". Perforated Paper, threads, beads and a Snowman button are included in the kit. 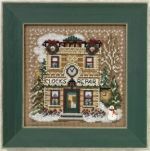 Clock Shoppe one of the Buttons and Beads Kits in the Christmas Village collection is complete with 14count perforated paper, DMC floss, beads and a Mill Hill button to complete this kit. The design size is 5" x 5". 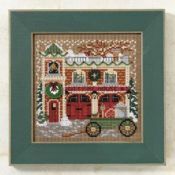 Firehouse one of the Buttons and Beads Kits in the Christmas Village collection is complete with 14count perforated paper, DMC floss, beads and a Mill Hill button to complete this kit. The design size is 5" x 5". 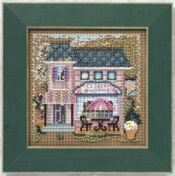 The Ice Cream Shoppe by Mill Hill from the Main Street series is stitched on 14count perforated paper. This kit includes floss, beads and an ice cream cone button to enhance your finished piece. The design size is 5" x 5". 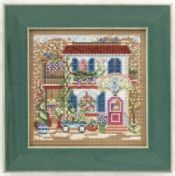 Main Street-Flower Shop from Mill Hill Button & Beads kit is stitched on 14ct Brown Perforated Paper with a finished size of 5" x 5". Perforated Paper, threads, beads and a Flower button are included in the kit. Millinery Shoppe one of the Buttons and Beads Kits from the Main Street collection is complete with 14count perforated paper, DMC floss, beads and a Mill Hill button to complete this kit. The design size is 5" x 5". 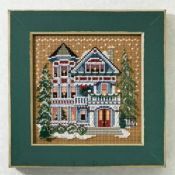 The Queen Anne House by Mill Hill from the Christmas Village series is stitched on 14count perforated paper. 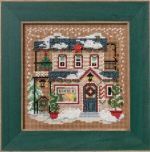 This kit includes floss, beads and a christmas tree button to enhance your finished piece. The design size is 5" x 5". 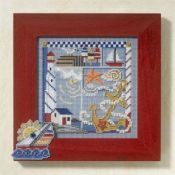 The Seaside Sampler from the Spring Series of the Buttons and Bead kits from Mill Hill is stitched on 14count perforated paper. The kit contains the perforated paper, floss, beads and a red star button.